In celebration of the Lunar New Year (28 January 2017), I have curated a small group of Chinese New Year pictures and propaganda posters. The brightly coloured posters portray elements of Chinese political visual culture. They were heavily influenced by The New Year pictures (nianhua) which were the most common form of household decoration in China until the mid-20th century. 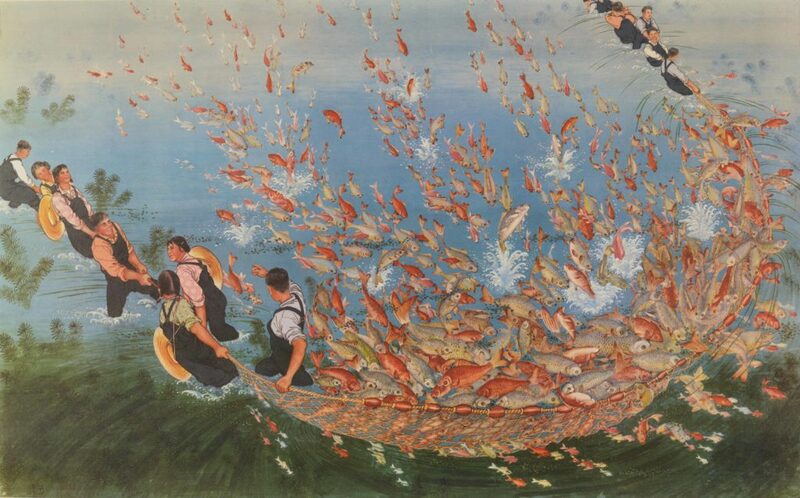 Poster, ‘The commune’s fish pond’, ink on paper, Beijing, China, 1973, MAAS Collection. Employing various elements of folk art and symbolism, these pictures catered to the tastes and beliefs of the countryside, expressing wishes for happiness, prosperity and good luck. Fish, flowers and fruits are common motifs. The Chinese word for ‘fish (yu)’ is phonetically identical with the word meaning ‘abundance’, so the fish symbolises wealth. Chubby babies are popular motifs and a peach is a common symbol of longevity. New Year picture, ‘Plentiful harvest (Fengshouyouyu)’, Hong Kong, China, 1960-90s, MAAS Collection. New Year picture, ‘Health and longevity (Jiankangchangshou)’, Hong Kong, China, 1960s-90s, MAAS Collection. This display shows small examples of nianhua produced in Hong Kong before it returned to Chinese rule in 1997, as well as propaganda posters from mainland China. New Year picture, ‘Joyful celebration for the abundant harvest (Xiqingfengshou)’, Hong Kong, China, 1960s-90s, MAAS Collection. Propaganda poster, ‘Busy with a bumper harvest (Fengshoumang)’ by Qin Yongchun, Beijing, China, 1960s-90s, MAAS Collection. The Lunar New Year is the most significant annual celebration in China and some other parts of Asia. Chinese people decorate doors, windows and walls of a room with brightly coloured New Year pictures for happiness, prosperity, longevity and good luck. This year is the Year of the Rooster, the tenth animal in the Chinese zodiac. If you were born in 1933, 1945, 1957, 1969, 1981, 1993 or 2005, then it is your year! People born in the Year of the Rooster are observant, hardworking, courageous and talented. 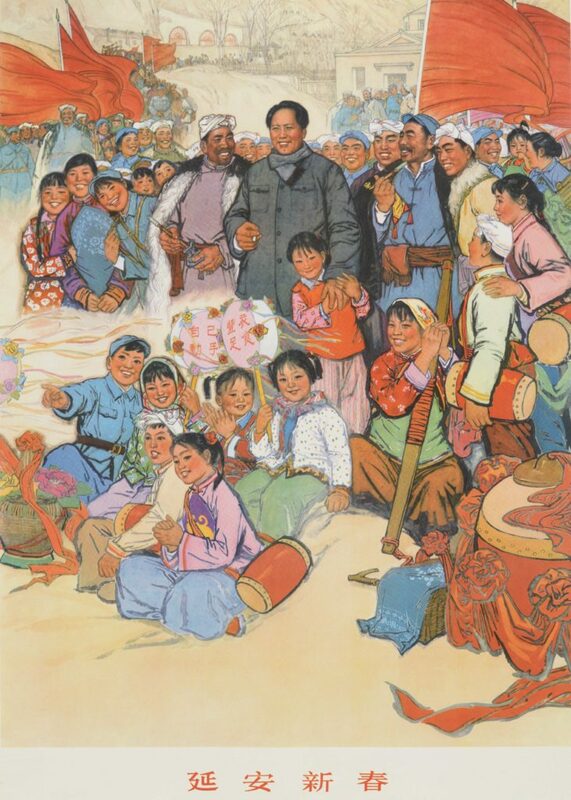 Propaganda poster & New Year picture, ‘New Year in Yann’an (Yan’an xinchun)’, by Liu Wenxi, Beijing, China, early 1970s, MAAS Collection. Propaganda poster, ‘Working women are a great revolutionary force (Laodongfunu shiweidadegemingliliang)’, Shanghai, China, 1974, MAAS Collection. The display is a small selection from a recent acquisition of a large group of 40 Chinese posters. The collection comes from the estate of the late Ms Norma Moriceau, a costume designer and art director who travelled extensively. Norma died 22 August 2016 and the Museum purchased the collection from Theodore Bruce Auction on 26 November 2016. You can see the display until August 2017 on Level 2 at the Powerhouse Museum.